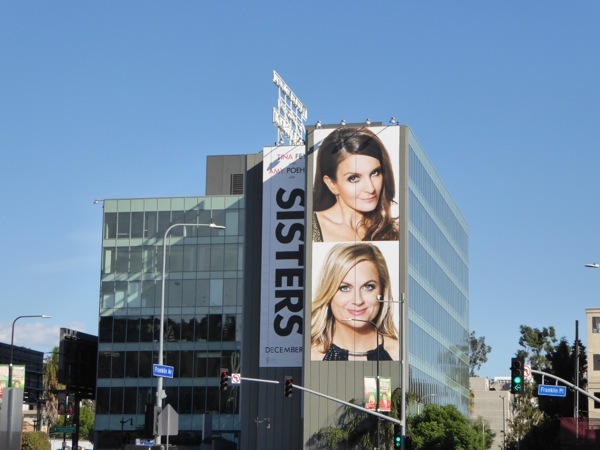 Welcome to another fabulous themed MOVIE WEEK here at Daily Billboard, and to kick us off here's an assortment of outdoor ads for Tina Fey and Amy Poehler's new comedy, Sisters. This dynamic duo, and self-confessed best-friends in real-life, star as siblings in their first big screen outing opposite each other since 2008's Baby Mama. The pair of funny ladies have frequently been hilarious on the small screen, in the likes of 30 Rock and Parks and Recreation, but have yet to enjoy large scale cinematic success together. In Sisters, they play 'Kate' (Fey) and 'Maura Ellis' (Poehler) who are about to bid farewell to their childhood home with one last unforgettable party before it's sold (whilst their parents are away). 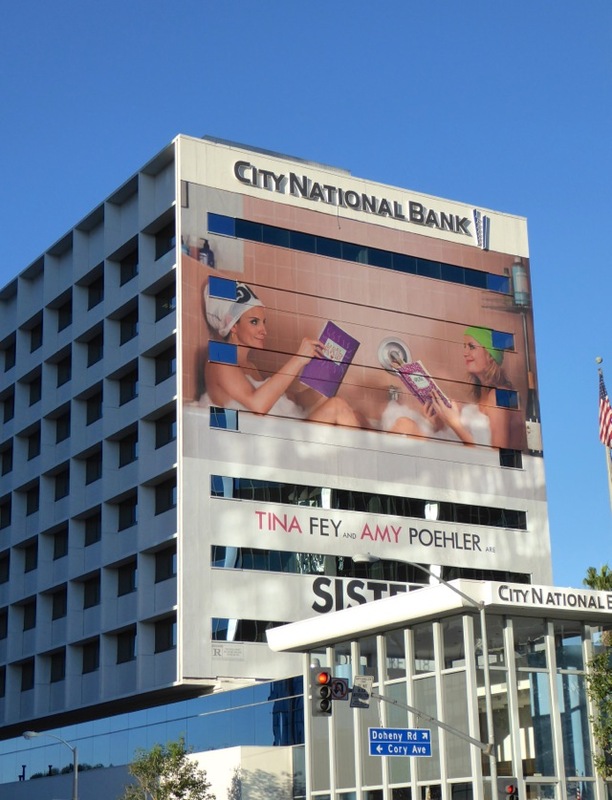 These bathtub billboards for Sisters are a lot of fun, hinting at the special bond between the two ladies, and come in all sizes and formats. 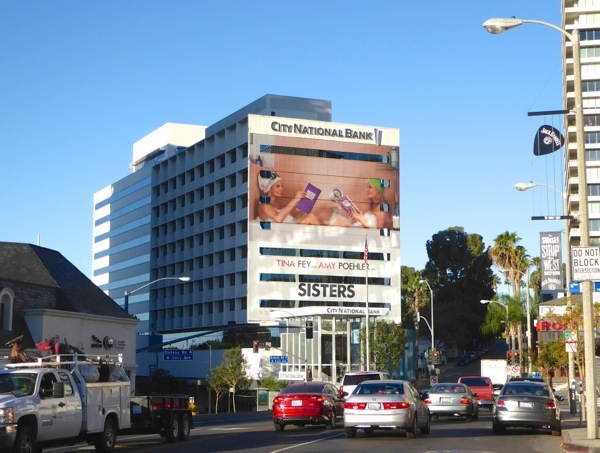 The special extension movie billboards and smaller ad were snapped along Olympic Boulevard, La Brea Avenue and Melrose Avenue from November 18 to November 29, 2015. 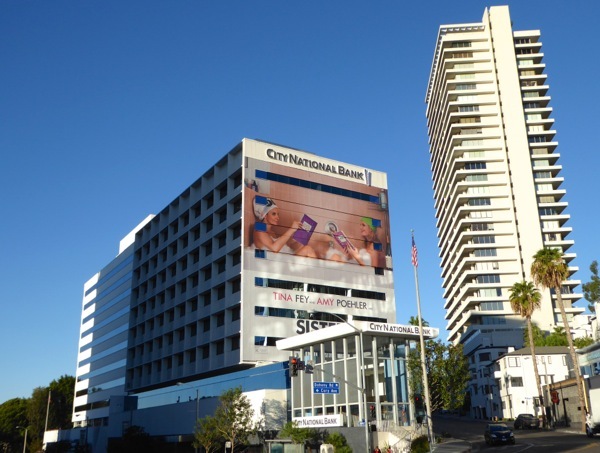 Meanwhile a giant-sized shared bathtub creative was snapped at the start of the Sunset Strip in West Hollywood on November 23, plus another pair of super-sized ad creatives were snapped at the busy Hollywood intersection of Franklin and Highland Avenues on November 25, 2015. This comedic duo have have TV audiences in stitches the past three years as hosts of the Golden Globes awards ceremony, so let's hope they can replicate the laughs and slapstick humour at the box office this season. 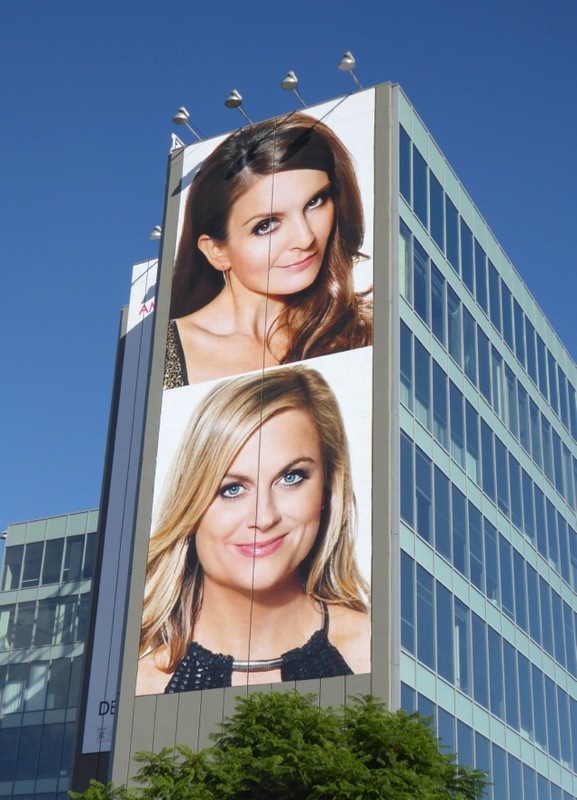 If you're a fan of the ladies, be sure to check out their Golden Globes billboards and also this 30 Rock billboard and these Parks and Recreation billboards. 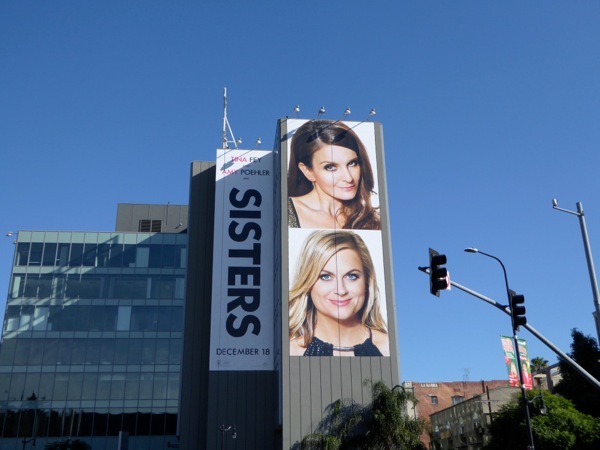 Get ready to let your freak flag fly on December 18 with these Sisters, and stick around for the rest of the week for a peak at the other film billboards crowding L.A.'s festive skies.